The authors of the review point to evidence indicating that low vitamin D levels are the consequence, not the cause, of ill health. This is particularly concerning in light of the evidence that high blood levels of vitamin D seem to increase risk of death, falls, and cancer. Get vitamin D through natural sources rather than supplements. A blood level of 20–40 ng/ml is a reasonable target, but I only recommend supplementing with 1,000–2,000 IU of vitamin D3 daily if you are not able to get enough vitamin D from natural sources like oil-rich fish (salmon, tuna, sardines, etc.) and non-burning sunlight on as many square inches of bare skin as is socially acceptable. Mushrooms which have been exposed to ultraviolet light for a few hours may emerge as another useful vitamin D supplement. Despite decades of research it is still not known if taking vitamin D supplements will provide the same benefits, or if people who naturally have higher blood levels of vitamin D are healthy for some other reason. 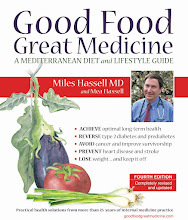 For more detail and some useful general resources on nutritional supplements, see page 89 of Good Food, Great Medicine, 3rd edition – and then check out Salmon Cakes (page 227), Tuna and White Bean Salad (page 232), and Sardine Pâté (page 152) for a few of our favorite ways to improve vitamin D levels!